Today is International Day of Charity and Charity Tuesday so for our weekly charity post we are sharing another rescue cat in the hope of finding him a forever home. Pixie is adorable. I hope he gets a forever home soon. That big guy is Pixie? Should be Paul Bunyan! Pixie is a cutie, hope he gets his forever soon! What a handsome boy Pixie is! 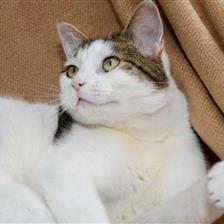 Pixie sounds like such a fun kitty! Aww, Pixie is so cute! Great video! Pixie is handsome! We loved his video, too. We're sharing, and hope he finds his forever home soon!